One of the many pleasures of camping is enjoying tasty food that has been prepared over a campfire! 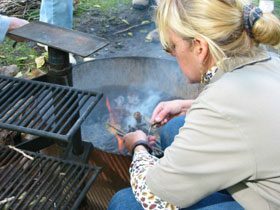 Come hear Winnebago County Naturalist Lisa Ralls discus and demonstrate how to fix tasty, yet nutritious, foods over a campfire using easy and proven techniques that can be used throughout the summer. Food and recipes to take home will be provided! You must call to preregister for Course #3477.